Wittenborg students recently had the privilege to get some career advice from Paralympic coach Dr Gary Brickley who knows all about what it takes to win gold at a top international level. Brickley gave a seminar at Wittenborg’s location in Apeldoorn entitled “Three decades of change in sport performance and physical activity”. 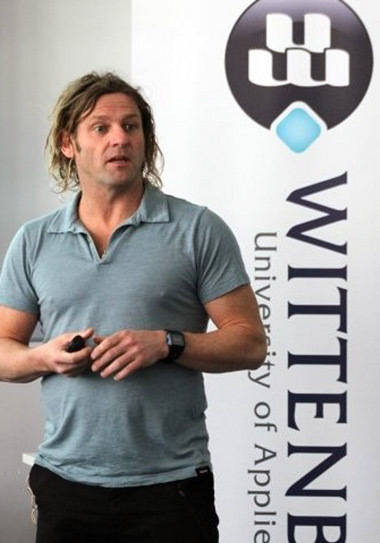 Besides his work with Paralympic athletes, Brickley is also a senior lecturer at the University of Brighton in the UK, Wittenborg’s main education partner. Brickley also had some advice for students aiming to carve out a career in the sport industry. “Work hard at your studies and gain as much experience as you can. Volunteer at big sporting events and talk to people affiliated with the sport industry. It is also important that you choose the right university and the right programme for your studies. Finally, developing your communication skills is very important,” Brickley said.